We’re pleased to announce a new version of the Smartbar extension (V6.0). 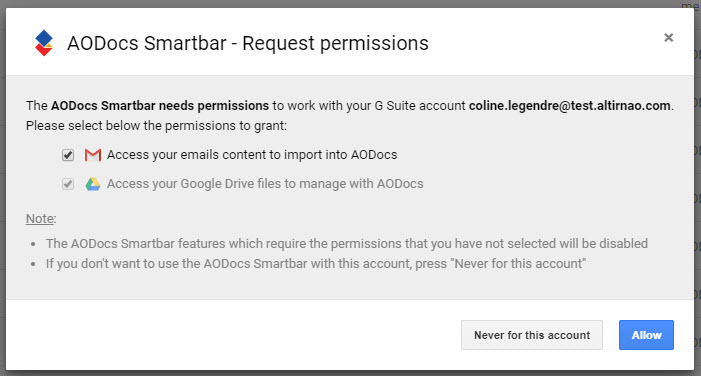 AODocs Smartbar release 6.0 focuses on improvements to the authorization flow and bug fixes. As announced few weeks ago, we have a new Smartbar Marketplace App. Installing this Marketplace app in G Suite will grant domain wide authorization to your users, preventing them from seeing the permissions pop-up. 1. Install the Smartbar Marketplace App to manage scopes and permissions. 2. Deploy the Smartbar extension for all your end-users in one go. Your end-users will be able to use the Smartbar extension with no action on their side. Email Cc field is always imported when creating a document into AODocs from Gmail. The Smartbar no longer displays the warning icon by default on Chrome Os. Breadcrumb appears again for all Google documents managed by AODocs. You're now able to use UFO on Drive, if the Smartbar is disabled for the current account.